The Shroud of Turin or Turin Shroud (Italian: Sindone di Torino, Sacra Sindone [ˈsaːkra ˈsindone] or Santa Sindone) is a length of linen cloth bearing the negative image of a man. Some believe the image depicts Jesus of Nazareth and the fabric is the burial shroud in which he was wrapped after crucifixion. Historical and scientific evidence points to it being a medieval creation. It is first securely attested in 1390, when a local bishop wrote that the shroud was a forgery and that an unnamed artist had confessed, and radiocarbon dating of a sample of the fabric is consistent with this date. It is kept in the Chapel of the Holy Shroud, which is located within a complex of buildings which includes the Turin Cathedral, the Royal Palace of Turin, and the Palazzo Chiablese in Turin, Piedmont, northern Italy. The Catholic Church has neither formally endorsed nor rejected the shroud, but in 1958 Pope Pius XII approved of the image in association with the devotion to the Holy Face of Jesus. Pope John Paul II called the Shroud "a mirror of the Gospel". Other Christian denominations, such as Anglicans and Methodists, have also shown devotion to the Shroud of Turin. Diverse arguments have been made in scientific and popular publications claiming to prove that the cloth is the authentic burial shroud of Jesus, based on disciplines ranging from chemistry to biology and medical forensics to optical image analysis. In 1988, three radiocarbon dating tests dated a corner piece of the shroud from the Middle Ages, between the years 1260 and 1390. Some shroud researchers have challenged the dating, arguing the results were skewed by the introduction of material from the Middle Ages to the portion of the shroud used for radiocarbon dating. However, all of the hypotheses used to challenge the radiocarbon dating have been scientifically refuted, including the medieval repair hypothesis, the bio-contamination hypothesis and the carbon monoxide hypothesis. The image on the shroud is much clearer in black-and-white negative than in its natural sepia color, and this negative image was first observed in 1898 on the reverse photographic plate of amateur photographer Secondo Pia, who was allowed to photograph it while it was being exhibited. A variety of methods have been proposed for the formation of the image, but the actual method used has not yet been conclusively identified. The shroud continues to be both intensely studied and controversial. The shroud is rectangular, measuring approximately 4.4 by 1.1 metres (14 ft 5 in × 3 ft 7 in). The cloth is woven in a three-to-one herringbone twill composed of flax fibrils. Its most distinctive characteristic is the faint, brownish image of a front and back view of a naked man with his hands folded across his groin. The two views are aligned along the midplane of the body and point in opposite directions. The front and back views of the head nearly meet at the middle of the cloth. The image of the "Man of the Shroud" has a beard, moustache, and shoulder-length hair parted in the middle. He is muscular and tall (various experts have measured him as from 1.70 to 1.88 m or 5 ft 7 in to 6 ft 2 in). Reddish-brown stains are found on the cloth, showing various wounds that, according to proponents, correlate with the yellowish image, the pathophysiology of crucifixion, and the Biblical description of the death of Jesus. In May 1898 Italian photographer Secondo Pia was allowed to photograph the shroud. He took the first photograph of the shroud on 28 May 1898. In 1931, another photographer, Giuseppe Enrie, photographed the shroud and obtained results similar to Pia's. In 1978, ultraviolet photographs were taken of the shroud. The shroud was damaged in a fire in 1532 in the chapel in Chambery, France. There are some burn holes and scorched areas down both sides of the linen, caused by contact with molten silver during the fire that burned through it in places while it was folded. Fourteen large triangular patches and eight smaller ones were sewn onto the cloth by Poor Clare nuns to repair the damage. The historical records for the shroud can be separated into two time periods: before 1390 and from 1390 to the present. Prior to 1390 there are some similar images such as the Pray Codex. However, what is claimed by some to be the image of a shroud on the Pray Codex has crosses on one side, an interlocking step pyramid pattern on the other, and no image of Jesus. Critics point out that it may not be a shroud at all, but rather a rectangular tombstone, as seen on other sacred images. The text of the codex also fails to mention a miraculous image on the codex shroud. The first possible historical record dates from 1353 or 1357. and the first certain record (in Lirey, France) in 1390 when Bishop Pierre d'Arcis wrote a memorandum to Pope Clement VII (Avignon Obedience), stating that the shroud was a forgery and that the artist had confessed. Historical records seem to indicate that a shroud bearing an image of a crucified man existed in the small town of Lirey around the years 1353 to 1357 in the possession of a French Knight, Geoffroi de Charny, who died at the Battle of Poitiers in 1356. However the correspondence of this shroud in Lirey with the shroud in Turin, and its origin has been debated by scholars and lay authors, with statements of forgery attributed to artists born a century apart. Some contend that the Lirey shroud was the work of a confessed forger and murderer. There are no definite historical records concerning the particular shroud currently at Turin Cathedral prior to the 14th century. A burial cloth, which some historians maintain was the Shroud, was owned by the Byzantine emperors but disappeared during the Sack of Constantinople in 1204. Although there are numerous reports of Jesus' burial shroud, or an image of his head, of unknown origin, being venerated in various locations before the 14th century, there is no historical evidence that these refer to the shroud currently at Turin Cathedral. The history of the shroud from the 15th century is well recorded. In 1453 Margaret de Charny deeded the Shroud to the House of Savoy. In 1578 the shroud was transferred to Turin. Since the 17th century the shroud has been displayed (e.g. in the chapel built for that purpose by Guarino Guarini) and in the 19th century it was first photographed during a public exhibition. In 1532, the shroud suffered damage from a fire in a chapel of Chambéry, capital of the Savoy region, where it was stored. A drop of molten silver from the reliquary produced a symmetrically placed mark through the layers of the folded cloth. Poor Clare Nuns attempted to repair this damage with patches. In 1578 Emmanuel Philibert, Duke of Savoy ordered the cloth to be brought from Chambéry to Turin and it has remained at Turin ever since. Repairs were made to the shroud in 1694 by Sebastian Valfrè to improve the repairs of the Poor Clare nuns. Further repairs were made in 1868 by Clotilde of Savoy. The shroud remained the property of the House of Savoy until 1983, when it was given to the Holy See. A fire, possibly caused by arson, threatened the shroud on 11 April 1997. In 2002, the Holy See had the shroud restored. The cloth backing and thirty patches were removed, making it possible to photograph and scan the reverse side of the cloth, which had been hidden from view. A faint part-image of the body was found on the back of the shroud in 2004. The Shroud was placed back on public display (the 18th time in its history) in Turin from 10 April to 23 May 2010; and according to Church officials, more than 2 million visitors came to see it. On Holy Saturday (30 March) 2013, images of the shroud were streamed on various websites as well as on television for the first time in 40 years. Roberto Gottardo of the diocese of Turin stated that for the first time ever they had released high definition images of the shroud that can be used on tablet computers and can be magnified to show details not visible to the naked eye. As this rare exposition took place, Pope Francis issued a carefully worded statement which urged the faithful to contemplate the shroud with awe but, like his predecessors, he "stopped firmly short of asserting its authenticity". The shroud was again placed on display in the cathedral in Turin from 19 April 2015 until 24 June 2015. There was no charge to view it, but an appointment was required. The Shroud has undergone several restorations and several steps have been taken to preserve it to avoid further damage and contamination. It is kept under laminated bulletproof glass in an airtight case. The temperature- and humidity-controlled case is filled with argon (99.5%) and oxygen (0.5%) to prevent chemical changes. The Shroud itself is kept on an aluminum support sliding on runners and stored flat within the case. Religious beliefs about the burial cloths of Jesus have existed for centuries. The Gospels of Matthew,[27:59–60] Mark,[15:46] and Luke[23:53] state that Joseph of Arimathea wrapped the body of Jesus in a piece of linen cloth and placed it in a new tomb. The Gospel of John[19:38–40] refers to strips of linen used by Joseph of Arimathea and states that Apostle Peter found multiple pieces of burial cloth after the tomb was found open, strips of linen cloth for the body and a separate cloth for the head. [20:6–7] The Gospel of the Hebrews, a 2nd-century manuscript, states that Jesus gave the linen cloth to the servant of the priest. Although pieces said to be of burial cloths of Jesus are held by at least four churches in France and three in Italy, none has gathered as much religious following as the Shroud of Turin. The religious beliefs and practices associated with the shroud predate historical and scientific discussions and have continued in the 21st century, although the Catholic Church has never passed judgment on its authenticity. An example is the Holy Face Medal bearing the image from the shroud, worn by some Catholics. Indeed, the Shroud of Turin is respected by Christians of several traditions, including Baptists, Catholics, Lutherans, Methodists, Orthodox, Pentecostals, and Presbyterians. Several Lutheran parishes have hosted replicas of the Shroud of Turin, for didactic and devotional purposes. In 1543 John Calvin, in his Treatise on Relics, wrote of the shroud, which was then at Nice (it was moved to Turin in 1578), "How is it possible that those sacred historians, who carefully related all the miracles that took place at Christ's death, should have omitted to mention one so remarkable as the likeness of the body of our Lord remaining on its wrapping sheet?" In an interpretation of the Gospel of John,[20:6–7] Calvin concluded that strips of linen were used to cover the body (excluding the head) and a separate cloth to cover the head. He then stated that "either St. John is a liar", or else anyone who promotes such a shroud is "convicted of falsehood and deceit". 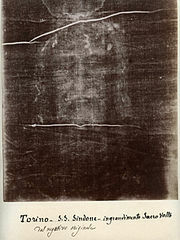 Although the shroud image is currently associated with Catholic devotions to the Holy Face of Jesus, the devotions themselves predate Secondo Pia's 1898 photograph. Such devotions had been started in 1844 by the Carmelite nun Marie of St Peter (based on "pre-crucifixion" images associated with the Veil of Veronica) and promoted by Leo Dupont, also called the Apostle of the Holy Face. In 1851 Dupont formed the "Archconfraternity of the Holy Face" in Tours, France, well before Secondo Pia took the photograph of the shroud. The religious concept of the miraculous acheiropoieton has a long history in Christianity, going back to at least the 6th century. Among the most prominent portable early acheiropoieta are the Image of Camuliana and the Mandylion or Image of Edessa, both painted icons of Christ held in the Byzantine Empire and now generally regarded as lost or destroyed, as is the Hodegetria image of the Virgin. Other early images in Italy, all heavily and unfortunately restored, that have been revered as acheiropoieta now have relatively little following, as attention has focused on the Shroud. Proponents for the authenticity of the Shroud of Turin argue that empirical analysis and scientific methods are insufficient for understanding the methods used for image formation on the shroud, believing that the image was miraculously produced at the moment of Resurrection. Some proponents have argued that the image on the shroud can be explained with scientific evidence that supports the Gospel narrative. John Jackson (a member of STURP) proposed that the image was formed by radiation methods beyond the understanding of current science, in particular via the "collapsing cloth" onto a body that was radiating energy at the moment of resurrection. However, STURP member Alan Adler has stated that Jackson's theory is not generally accepted as scientific, given that it runs counter to the laws of physics. 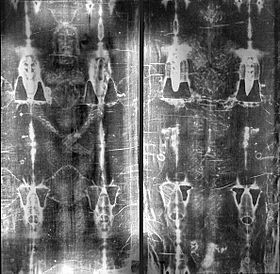 In 1989 physicist Thomas Phillips speculated that the Shroud image was formed by neutron radiation due to a miraculous bodily resurrection. Antipope Clement VII refrained from expressing his opinion on the shroud; however, subsequent popes from Julius II on took its authenticity for granted. The Vatican newspaper Osservatore Romano covered the story of Secondo Pia's photograph of 28 May 1898 in its edition of 15 June 1898, but it did so with no comment and thereafter Church officials generally refrained from officially commenting on the photograph for almost half a century. The first official association between the image on the Shroud and the Catholic Church was made in 1940 based on the formal request by Sister Maria Pierina De Micheli to the curia in Milan to obtain authorization to produce a medal with the image. The authorization was granted and the first medal with the image was offered to Pope Pius XII who approved the medal. The image was then used on what became known as the Holy Face Medal worn by many Catholics, initially as a means of protection during World War II. In 1958 Pope Pius XII approved of the image in association with the devotion to the Holy Face of Jesus, and declared its feast to be celebrated every year the day before Ash Wednesday. Following the approval by Pope Pius XII, Catholic devotions to the Holy Face of Jesus have been almost exclusively associated with the image on the shroud. In 1983 the Shroud was given to the Holy See by the House of Savoy. However, as with all relics of this kind, the Roman Catholic Church made no pronouncements on its authenticity. As with other approved Catholic devotions, the matter has been left to the personal decision of the faithful, as long as the Church does not issue a future notification to the contrary. In the Church's view, whether the cloth is authentic or not has no bearing whatsoever on the validity of what Jesus taught or on the saving power of his death and resurrection. Pope John Paul II stated in 1998 that: "Since it is not a matter of faith, the Church has no specific competence to pronounce on these questions. She entrusts to scientists the task of continuing to investigate, so that satisfactory answers may be found to the questions connected with this Sheet." Pope John Paul II showed himself to be deeply moved by the image of the Shroud and arranged for public showings in 1998 and 2000. In his address at the Turin Cathedral on Sunday 24 May 1998 (the occasion of the 100th year of Secondo Pia's 28 May 1898 photograph), he said: "The Shroud is an image of God's love as well as of human sin ... The imprint left by the tortured body of the Crucified One, which attests to the tremendous human capacity for causing pain and death to one's fellow man, stands as an icon of the suffering of the innocent in every age." In 2000, Cardinal Ratzinger, later to become Pope Benedict XVI, wrote that the Shroud of Turin is "a truly mysterious image, which no human artistry was capable of producing. In some inexplicable way, it appeared imprinted upon cloth and claimed to show the true face of Christ, the crucified and risen Lord". In June 2008, three years after he assumed the papacy, Pope Benedict announced that the Shroud would be publicly displayed in the spring of 2010, and stated that he would like to go to Turin to see it along with other pilgrims. During his visit in Turin on Sunday 2 May 2010, Benedict described the Shroud of Turin as an "extraordinary Icon", the "Icon of Holy Saturday ... corresponding in every way to what the Gospels tell us of Jesus", "an Icon written in blood, the blood of a man who was scourged, crowned with thorns, crucified and whose right side was pierced". The pope said also that in the Turin Shroud "we see, as in a mirror, our suffering in the suffering of Christ". On 30 May 2010, Benedict XVI beatified Sister Maria Pierina De Micheli who coined the Holy Face Medal, based on Secondo Pia's photograph of the Shroud. On 30 March 2013, as part of the Easter celebrations, there was an extraordinary exposition of the shroud in the Cathedral of Turin. Pope Francis recorded a video message for the occasion, in which he described the image on the shroud as "this Icon of a man", and stated that "the Man of the Shroud invites us to contemplate Jesus of Nazareth." In his carefully worded statement Pope Francis urged the faithful to contemplate the shroud with awe, but "stopped firmly short of asserting its authenticity". During his weekly general audience on 5 November 2014, Pope Francis announced he would go on a pilgrimage to Turin on 21 June 2015, to pray before, venerate the Holy Shroud and honor St. John Bosco on the bicentenary of his birth. Station biologique de Roscoff in Brittany, France where the first scientific analysis of the photographs of the shroud was performed by Yves Delage in 1902. Sindonology (from the Greek σινδών—sindon, the word used in the Gospel of Mark[15:46] to describe the type of the burial cloth of Jesus) is the formal study of the Shroud. The Oxford English Dictionary cites the first use of this word in 1964: "The investigation ... assumed the stature of a separate discipline and was given a name, sindonology", but also identifies the use of "sindonological" in 1950 and "sindonologist" in 1953. Secondo Pia's 1898 photographs of the shroud allowed the scientific community to begin to study it. A variety of scientific theories regarding the shroud have since been proposed, based on disciplines ranging from chemistry to biology and medical forensics to optical image analysis. The scientific approaches to the study of the Shroud fall into three groups: material analysis (both chemical and historical), biology and medical forensics and image analysis. The initial steps towards the scientific study of the shroud were taken soon after the first set of black and white photographs became available early in the 20th century. In 1902 Yves Delage, a French professor of comparative anatomy, published the first study on the subject. Delage declared the image anatomically flawless and argued that the features of rigor mortis, wounds, and blood flows were evidence that the image was formed by direct or indirect contact with a corpse. William Meacham mentions several other medical studies between 1936 and 1981 that agree with Delage. However, these were all indirect studies without access to the shroud itself. The first direct examination of the shroud by a scientific team was undertaken in 1969–1973 in order to advise on preservation of the shroud and determine specific testing methods. This led to the appointment of an 11-member Turin Commission to advise on the preservation of the relic and on specific testing. Five of the commission members were scientists, and preliminary studies of samples of the fabric were conducted in 1973. In 1976 physicist John P. Jackson, thermodynamicist Eric Jumper and photographer William Mottern used image analysis technologies developed in aerospace science for analyzing the images of the Shroud. In 1977 these three scientists and over thirty others formed the Shroud of Turin Research Project. In 1978 this group, often called STURP, was given direct access to the Shroud. Also in 1978, independently from the STURP research, Giovanni Tamburelli obtained at CSELT a 3D-elaboration from the Shroud with higher resolution than Jumper and Mottern. A second result of Tamburelli was the electronic removal from the image of the blood that apparently covers the face. After years of discussion, the Holy See permitted radiocarbon dating on portions of a swatch taken from a corner of the shroud. Independent tests in 1988 at the University of Oxford, the University of Arizona, and the Swiss Federal Institute of Technology concluded with 95% confidence that the shroud material dated to 1260–1390 AD. This 13th- to 14th-century dating is much too recent for the shroud to have been associated with Jesus of Nazareth. The dating does on the other hand match the first appearance of the shroud in church history. This dating is also slightly more recent than that estimated by art historian W. S. A. Dale, who postulated on artistic grounds that the shroud is an 11th-century icon made for use in worship services. Some proponents for the authenticity of the shroud have attempted to discount the radiocarbon dating result by claiming that the sample may represent a medieval "invisible" repair fragment rather than the image-bearing cloth. However, all of the hypotheses used to challenge the radiocarbon dating have been scientifically refuted, including the medieval repair hypothesis, the bio-contamination hypothesis and the carbon monoxide hypothesis. In 2013, Giulio Fanti performed new dating studies on fragments obtained from the shroud. He performed three different tests including ATR–FTIR and Raman spectroscopy (absorption of light of different colors). The date range from these tests date the shroud between 300 BC and 400 AD. These studies have been publicly disregarded by Cesare Nosiglia, archbishop of Turin and custodian of the shroud. Archbishop Nosiglia stated that "as it is not possible to be certain that the analysed material was taken from the fabric of the shroud no serious value can be recognized to the results of such experiments". In the 1970s a special eleven-member Turin Commission conducted several tests. Conventional and electron microscopic examination of the Shroud at that time revealed an absence of heterogeneous coloring material or pigment. In 1979, Walter McCrone, upon analyzing the samples he was given by STURP, concluded that the image is actually made up of billions of submicrometre pigment particles. The only fibrils that had been made available for testing of the stains were those that remained affixed to custom-designed adhesive tape applied to thirty-two different sections of the image. John Heller and Alan Adler examined the same samples and agreed with McCrone's result that the cloth contains iron oxide. However, they concluded, the exceptional purity of the chemical and comparisons with other ancient textiles showed that, while retting flax absorbs iron selectively, the iron itself was not the source of the image on the shroud. In 2000, fragments of a burial shroud from the 1st century were discovered in a tomb near Jerusalem, believed to have belonged to a Jewish high priest or member of the aristocracy. The shroud was composed of a simple two-way weave, unlike the complex herringbone twill of the Turin Shroud. Based on this discovery, the researchers stated that the Turin Shroud did not originate from Jesus-era Jerusalem. According to textile expert Mechthild Flury-Lemberg of Hamburg, a seam in the cloth corresponds to a fabric found at the fortress of Masada near the Dead Sea, which dated to the 1st century. The weaving pattern, 3:1 twill, is consistent with first-century Syrian design, according to the appraisal of Gilbert Raes of the Ghent Institute of Textile Technology in Belgium. Flury-Lemberg stated: "The linen cloth of the Shroud of Turin does not display any weaving or sewing techniques which would speak against its origin as a high-quality product of the textile workers of the first century." Joseph Kohlbeck from the Hercules Aerospace Company in Utah and Richard Levi-Setti of the Enrico Fermi Institute examined some dirt particles from the Shroud surface. The dirt was found to be travertine aragonite limestone. There are several reddish stains on the shroud suggesting blood, but it is uncertain whether these stains were produced at the same time as the image, or afterwards. McCrone (see painting hypothesis) identified these as containing iron oxide, theorizing that its presence was likely due to simple pigment materials used in medieval times. Other researchers, including Alan Adler, identified the reddish stains as blood and interpreted the iron oxide as a natural residue of hemoglobin. Working independently, forensic pathologist Pier Luigi Baima Bollone concurred with Heller and Adler's findings and identified the blood as the AB blood group. Joe Nickell argues that results similar to Heller and Adler's could be obtained from tempera paint. Skeptics also cite other forensic blood tests whose results dispute the authenticity of the Shroud, and point to the possibility that the blood could belong to a person handling the shroud, and that the apparent blood flows on the shroud are unrealistically neat. In 1997 Avinoam Danin, a botanist at the Hebrew University of Jerusalem, reported that he had identified Chrysanthemum coronarium (now called Glebionis coronaria), Cistus creticus and Zygophyllum whose pressed image on the shroud was first noticed by Alan Whanger in 1985 on the photographs of the shroud taken in 1931. He reported that the outlines of the flowering plants would point to March or April and the environs of Jerusalem. In a separate report in 1978 Danin and Uri Baruch reported on the pollen grains on the cloth samples, stating that they were appropriate to the spring in Israel. Max Frei, a Swiss police criminologist who initially obtained pollen from the shroud during the STURP investigation, stated that of the 58 different types of pollens found, 45 were from the Jerusalem area, while six were from the eastern Middle East, with one pollen species growing exclusively in Istanbul, and two found in Edessa, Turkey. Mark Antonacci argues that the pollen evidence and flower images are inherently interwoven and strengthen each other. However it was subsequently determined that Baruch's work was "scientifically unsafe", and Danin thereafter disowned the publication of this work. Skeptics have argued that the flower images are too faint for Danin's determination to be definite, that an independent review of the pollen strands showed that one strand out of the 26 provided contained significantly more pollen than the others, perhaps pointing to deliberate contamination. Skeptics also argue that Max Frei had previously been duped in his examination of the Hitler Diaries and that he may have also been duped in this case, or may have introduced the pollens himself. J. Beaulieau has stated that Frei was a self-taught amateur palynologist, was not properly trained, and that his sample was too small. In 2008 Avinoam Danin reported analysis based on the ultraviolet photographs of Miller and Pellicori taken in 1978. Danin reported five new species of flower, which also bloom in March and April and stated that a comparison of the 1931 black and white photographs and the 1978 ultraviolet images indicate that the flower images are genuine and not the artifact of a specific method of photography. A study published in 2011 by Lorusso and others subjected two photographs of the shroud to detailed modern digital image processing, one of them being a reproduction of the photographic negative taken by Giuseppe Enrie in 1931. They did not find any images of flowers or coins or anything else on either image, they noted that the faint images identified by the Whangers were "only visible by incrementing the photographic contrast", and they concluded that these signs may be linked to protuberances in the yarn, and possibly also to the alteration and influence of the texture of the Enrie photographic negative during its development in 1931. In 2015, Italian researchers Barcaccia et al. published a new study in Scientific Reports. They examined the human and non-human DNA found when the shroud and its backing cloth were vacuumed in 1977 and 1988. They found traces of 19 different plant taxa, including plants native to Mediterranean countries, Central Europe, North Africa, the Middle East, Eastern Asia (China) and the Americas. Of the human mtDNA, sequences were found belonging to haplogroups that are typical of various ethnicities and geographic regions, including Europe, North and East Africa, the Middle East and India. A few non-plant and non-human sequences were also detected, including various birds and one ascribable to a marine worm common in the Northern Pacific Ocean, next to Canada. After sequencing some DNA of pollen and dust found on the shroud, they confirmed that many people from many different places came in contact with the shroud. According to the scientists, "such diversity does not exclude a Medieval origin in Europe but it would be also compatible with the historic path followed by the Turin Shroud during its presumed journey from the Near East. Furthermore, the results raise the possibility of an Indian manufacture of the linen cloth." In 2017, a new examination claimed that "the most abundant pollen on the relic may be attribruted to the genus Helichrysum". According to the author, palynologist Marzia Boi, it "confirms and authenticates the theory that the corpse kept in the Shroud received a funeral and burial with all the honour and respect that would have been customary in the Hebrew tradition". Full length negatives of the shroud. A number of studies on the anatomical consistency of the image on the shroud and the nature of the wounds on it have been performed, following the initial study by Yves Delage in 1902. While Delage declared the image anatomically flawless, others have presented arguments to support both authenticity and forgery. In 1950 Pierre Barbet wrote a long study called A Doctor at Calvary which was later published as a book. Barbet stated that his experience as a battlefield surgeon during World War I led him to conclude that the image on the shroud was authentic, anatomically correct and consistent with crucifixion. For over a decade, Frederick Zugibe performed a number of studies using himself and volunteers suspended from a cross, and presented his conclusions in a book in 1998. Zugibe considered the shroud image and its proportions as authentic, but disagreed with Barbet and Bucklin on various details such as blood flow. Zugibe concluded that the image on the shroud is of the body of a man, but that the body had been washed. In 2001, Pierluigi Baima Bollone, a professor of forensic medicine in Turin, stated that the forensic examination of the wounds and bloodstains on the Shroud indicate that the image was that of the dead body of a man who was whipped, wounded around the head by a pointed instrument and nailed at the extremities before dying. In 2010 Giulio Fanti, professor of mechanical measurements, wrote that "apart from the hands afterward placed on the pubic area, the front and back images are compatible with the Shroud being used to wrap the body of a man 175 ± 2 cm (5 ft 9 in ± 1 in) tall, which, due to cadaveric rigidity, remained in the same position it would have assumed during crucifixion". Nickell, in 1983, and Gregory S. Paul in 2010, separately state that the proportions of the image are not realistic. Paul stated that the face and proportions of the shroud image are impossible, that the figure cannot represent that of an actual person and that the posture was inconsistent. 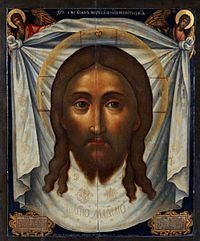 They argued that the forehead on the shroud is too small; and that the arms are too long and of different lengths and that the distance from the eyebrows to the top of the head is non-representative. They concluded that the features can be explained if the shroud is a work of a Gothic artist. A 2013 study analysed the wounds seemingly evident on the image in the shroud and compared them favorably to the wounds which the gospels state were inflicted on Jesus. However, the analysis of a crucified Roman, discovered near Venice in 2007, shows heel wounds consistent with those found on Jehohanan and are not consistent with wounds depicted on the shroud. Also, neither of the crucifixion victims known to archaeology show evidence of wrist wounds. Both art-historical, digital image processing and analog techniques have been applied to the shroud images. In 1976 Pete Schumacher, John Jackson and Eric Jumper analysed a photograph of the shroud image using a VP8 Image Analyzer, which was developed for NASA to create brightness maps of the moon. A brightness map (isometric display) interprets differences of brightness within an image as differences of elevation – brighter patches are seen as being closer to the camera, and darker patches further away. Our minds interpret these gradients as a "pseudo-three-dimensional image". [full citation needed] They found that, unlike any photograph they had analyzed, the shroud image has the property of decoding into a 3-dimensional image, when the darker parts of the image are interpreted to be those features of the man that were closest to the shroud and the lighter areas of the image those features that were farthest. The researchers could not replicate the effect when they attempted to transfer similar images using techniques of block print, engravings, a hot statue, and bas-relief. However optical physicist and former STURP member John Dee German has since noted that it is not difficult to make a photograph which has 3D qualities. If the object being photographed is lighted from the front, and a non-reflective "fog" of some sort exists between the camera and the object, then less light will reach and reflect back from the portions of the object that are farther from the lens, thus creating a contrast which is dependent on distance. Researchers Jackson, Jumper, and Stephenson report detecting the impressions of coins placed on both eyes after a digital study in 1978. They claimed to have seen a two-lepton coin on the right eyelid dating from 29–30, and a one-lepton coin on the left eyebrow minted in 29. The existence of the coin images is rejected by most scientists. 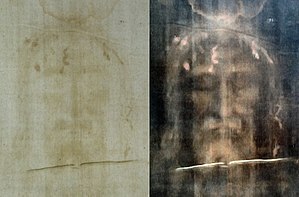 A study published in 2011 by Lorusso and others subjected two photographs of the shroud to detailed modern digital image processing, one of them being a reproduction of the photographic negative taken by Giuseppe Enrie in 1931. They did not find any images of flowers or coins or any other additional objects on the shroud in either photograph, they noted that the faint images identified by the Whangers were "only visible by incrementing the photographic contrast", and they concluded that these signs may be linked to protuberances in the yarn, and possibly also to the alteration and influence of the texture of the Enrie photographic negative during its development in 1931. The use of coins to cover the eyes of the dead is not attested for 1st-century Palestine. In 2004, in an article in Journal of Optics A, Fanti and Maggiolo reported finding a faint second face on the backside of the cloth, after the 2002 restoration. The front image of the Turin Shroud, 1.95 m long, is not directly compatible with the back image, 2.02 m long. If Jesus' dead body actually produced the images on the shroud, one would expect the bodily areas touching the ground to be more distinct. In fact, Jesus' hands and face are depicted with great detail, while his buttocks and his navel are faintly outlined or invisible, a discrepancy explained with the artist's consideration of modesty. Also, Jesus' right arm and hand are abnormally elongated, allowing him to modestly cover his genital area, which is physically impossible for an ordinary dead body lying supine. No wrinkles or other irregularities distort the image, which is improbable if the cloth had covered the irregular form of a body. For comparison, see oshiguma; the making of face-prints as an artform, in Japan. Furthermore, Jesus' physical appearance corresponds to Byzantine iconography. In 1979 Greek and Latin letters were reported as written near the face. These were further studied by André Marion, a professor at the École supérieure d'optique and his student Anne Laure Courage, in 1997. Subsequently, after performing computerized analysis and microdensitometer studies, they reported finding additional inscriptions, among them INNECEM (a shortened form of Latin "in necem ibis"—"you will go to death"), NNAZAPE(N)NUS (Nazarene), IHSOY (Jesus) and IC (Iesus Chrestus). The uncertain letters IBE(R?) have been conjectured as "Tiberius". Linguist Mark Guscin disputed the reports of Marion and Courage. He stated that the inscriptions made little grammatical or historical sense and that they did not appear on the slides that Marion and Courage indicated. In 2009, Barbara Frale, a paleographer in the Vatican Secret Archives, who had published two books on the Shroud of Turin reported further analysis of the text. In her books Frale had stated that the shroud had been kept by the Templars after 1204. In 2009 Frale stated that it is possible to read on the image the burial certificate of Jesus the Nazarene, or Jesus of Nazareth, imprinted in fragments of Greek, Hebrew and Latin writing. Frale stated the text on the Shroud reads: "In the year 16 of the reign of the Emperor Tiberius Jesus the Nazarene, taken down in the early evening after having been condemned to death by a Roman judge because he was found guilty by a Hebrew authority, is hereby sent for burial with the obligation of being consigned to his family only after one full year." Since Tiberius became emperor after the death of Octavian Augustus in AD 14, the 16th year of his reign would be within the span of the years AD 30 to 31. Frale's methodology has been criticized, partly based on the objection that the writings are too faint to see. Dr Antonio Lombatti, an Italian historian, rejected the idea that the authorities would have bothered to tag the body of a crucified man. He stated that "It's all the result of imagination and computer software." A study by Lorusso et al. subjected two photographs of the shroud to digital image processing, one of them being a reproduction of the photographic negative taken by Giuseppe Enrie in 1931. They did not find any signs, symbols or writing on either image, and noted that these signs may be linked to protuberances in the yarn, as well possibly as to the alteration and influence of the texture of the Enrie photographic negative during its development in 1931. The technique used for producing the image is, according to Walter McCrone, described in a book about medieval painting published in 1847 by Charles Lock Eastlake (Methods and Materials of Painting of the Great Schools and Masters). Eastlake describes in the chapter "Practice of Painting Generally During the XIVth Century" a special technique of painting on linen using tempera paint, which produces images with unusual transparent features—which McCrone compares to the image on the shroud. Pro-authenticity journals have declared this hypothesis to be unsound, stating that X-ray fluorescence examination, as well as infrared thermography, did not reveal any pigment. The non-paint origin has been further examined by Fourier transform of the image: common paintings show a directionality that is absent from the Turin Shroud. In 2009, Luigi Garlaschelli, professor of organic chemistry at the University of Pavia, announced that he had made a full size reproduction of the Shroud of Turin using only medieval technologies. Garlaschelli placed a linen sheet over a volunteer and then rubbed it with an acidic pigment. The shroud was then aged in an oven before being washed to remove the pigment. He then added blood stains, scorches and water stains to replicate the original. But according to Giulio Fanti, professor of mechanical and thermic measurements at the University of Padua, "the technique itself seems unable to produce an image having the most critical Turin Shroud image characteristics". Garlaschelli's reproduction was featured in a 2010 National Geographic documentary. The technique used by Garlaschelli included the bas relief approach (described below) but only for the image of the face. The resultant image was visibly similar to the Turin Shroud, though lacking the uniformity and detail of the original. According to the art historian Nicholas Allen, the image on the shroud was formed by a photographic technique in the 13th century. Allen maintains that techniques already available before the 14th century—e.g., as described in the Book of Optics, which was at just that time translated from Arabic to Latin—were sufficient to produce primitive photographs, and that people familiar with these techniques would have been able to produce an image as found on the shroud. To demonstrate this, he successfully produced photographic images similar to the shroud using only techniques and materials available at the time the shroud was supposedly made. He described his results in his PhD thesis, in papers published in several science journals, and in a book. Silver bromide is believed by some to have been used for making the Shroud of Turin as it is widely used in photographic films. Scientists Emily Craig and Randall Bresee have attempted to recreate the likenesses of the shroud through the dust-transfer technique, which could have been done by medieval arts. They first did a carbon-dust drawing of a Jesus-like face (using collagen dust) on a newsprint made from wood pulp (which is similar to 13th- and 14th-century paper). They next placed the drawing on a table and covered it with a piece of linen. They then pressed the linen against the newsprint by firmly rubbing with the flat side of a wooden spoon. By doing this they managed to create a reddish-brown image with a lifelike positive likeness of a person, a three-dimensional image and no sign of brush strokes. However, according to Fanti and Moroni, this does not reproduce many special features of the Shroud at microscopic level. Another hypothesis suggests that the Shroud may have been formed using a bas-relief sculpture. Researcher Jacques di Costanzo, noting that the Shroud image seems to have a three-dimensional quality, suggested that perhaps the image was formed using a three-dimensional object, such as a sculpture. While wrapping a cloth around a life-sized statue would result in a distorted image, placing a cloth over a bas-relief would result in an image like the one seen on the shroud. To demonstrate the plausibility of his hypothesis, Costanzo constructed a bas-relief of a Jesus-like face and draped wet linen over the bas-relief. After the linen dried, he dabbed it with a mixture of ferric oxide and gelatine. The result was an image similar to that of the Shroud. The imprinted image turned out to be wash-resistant, impervious to temperatures of 250 °C (482 °F) and was undamaged by exposure to a range of harsh chemicals, including bisulphite which, without the gelatine, would normally have degraded ferric oxide to the compound ferrous oxide. Similar results have been obtained by Nickell. Instead of painting, it has been suggested that the bas-relief could also be heated and used to scorch an image onto the cloth. However researcher Thibault Heimburger performed some experiments with the scorching of linen, and found that a scorch mark is only produced by direct contact with the hot object – thus producing an all-or-nothing discoloration with no graduation of color as is found in the shroud. According to Fanti and Moroni, after comparing the histograms of 256 different grey levels, it was found that the image obtained with a bas-relief has grey values included between 60 and 256 levels, but it is much contrasted with wide areas of white saturation (levels included between 245 and 256) and lacks of intermediate grey levels (levels included between 160 and 200). The face image on the Shroud instead has grey tonalities that vary in the same values field (between 60 and 256), but the white saturation is much less marked and the histogram is practically flat in correspondence of the intermediate grey levels (levels included between 160 and 200). The Maillard reaction is a form of non-enzymatic browning involving an amino acid and a reducing sugar. The cellulose fibers of the shroud are coated with a thin carbohydrate layer of starch fractions, various sugars, and other impurities. In a paper entitled "The Shroud of Turin: an amino-carbonyl reaction may explain the image formation," Raymond Rogers and Anna Arnoldi propose that amines from a recently deceased human body may have undergone Maillard reactions with this carbohydrate layer within a reasonable period of time, before liquid decomposition products stained or damaged the cloth. The gases produced by a dead body are extremely reactive chemically and within a few hours, in an environment such as a tomb, a body starts to produce heavier amines in its tissues such as putrescine and cadaverine. However the potential source for amines required for the reaction is a decomposing body,:100 and no signs of decomposition have been found on the Shroud. Rogers also notes that their tests revealed that there were no proteins or bodily fluids on the image areas. :38 Also, the image resolution and the uniform coloration of the linen resolution seem to be incompatible with a mechanism involving diffusion. Alan A. Mills argued that the image was formed by the chemical reaction auto-oxidation. He noted that the image corresponds to what would have been produced by a volatile chemical if the intensity of the color change were inversely proportional to the distance from the body of a loosely draped cloth. Since 1930 several researchers (J. Jackson, G. Fanti, T. Trenn, T. Phillips, J.-B. Rinaudo and others) endorsed the flash-like irradiation hypothesis. It was suggested that the relatively high definition of the image details can be obtained through the energy source (specifically, protonic) acting from inside. The Russian researcher Alexander Belyakov proposed an intense, but short flashlight source, which lasted some hundredths of a second. Some other authors suggest the X-radiation or a burst of directional ultraviolet radiation may have played a role in the formation of the Shroud image. From the image characteristics, several researchers have theorized that the radiant source was prevalently vertical. These theories do not include the scientific discussion of a method by which the energy could have been produced. During restoration in 2002, the back of the cloth was photographed and scanned for the first time. Giulio Fanti, a scientist at the University of Padua, wrote an article on this subject with colleagues in 2005 that envisages electrostatic corona discharge as the probable mechanism to produce the images of the body in the Shroud. Congruent with that mechanism, they also describe an image on the reverse side of the fabric, much fainter than that on the front view of the body, consisting primarily of the face and perhaps hands. As with the front picture, it is entirely superficial, with coloration limited to the carbohydrate layer. The images correspond to, and are in registration with, those on the other side of the cloth. No image is detectable in the reverse side of the dorsal view of the body. In December 2011, Fanti published a critical compendium of the major hypotheses regarding the formation of the body image on the shroud. He stated that "none of them can completely explain the mysterious image". Fanti then considered corona discharge as the most probable hypothesis regarding the formation of the body image. He stated that it would be impossible to reproduce all the characteristics of the image in a laboratory because the energy source required would be too high. Fanti has restated the radiation theories in a 2013 book. In December 2011 scientists at Italy's National Agency for New Technologies, Energy and Sustainable Development ENEA deduced from the STURP results that the color of the Shroud image is the result of an accelerated aging process of the linen, similar to the yellowing of the paper of ancient books. They demonstrated that the photochemical reactions caused by exposing linen to ultraviolet light could reproduce the main characteristics of the Shroud image, such as the shallowness of the coloration and the gradient of the color, which are not reproducible by other means. When subsequently illuminated with a UV lamp, the irradiated linen fabrics behaved like the linen of the Shroud. They also determined that UV radiation changes the crystalline structure of cellulose in a similar manner as aging and long-duration background radiation. Paolo Di Lazzaro, the lead researcher, indicated in an e-mail interview that "... it appears unlikely a forger may have done this image with technologies available in the Middle Ages or earlier", but their study does not mean the Shroud image was created by the flash of a miraculous resurrection, contrary to how the story was presented in the media, especially on the Web. Professional skeptic Joe Nickell states that the latest findings are nothing new despite being "dressed up in high-tech tests", and that they don't prove much of anything. In November 2011, F. Curciarello et al. published a paper that analyzed the abrupt changes in the yellowed fibril density values on the Shroud image. They concluded that the rapid changes in the body image intensity are not anomalies in the manufacturing process of the linen but that they can be explained with the presence of aromas or burial ointments. However, their work leaves the existence of an energy source for the image an open question. Replica of the Shroud of Turin, found in the Real Santuario del Cristo de La Laguna in Tenerife (Spain). ^ Joan Carroll Cruz, Saintly Men of Modern Times, Our Sunday Visitor, 2003, ISBN 1-931709-77-7, p. 200. ^ "Pope Francis and the Shroud of Turin - National Catholic Reporter". April 2013. Retrieved 6 June 2016. ^ a b c Barcaccia, Gianni; Galla, Giulio; Achilli, Alessandro; Olivieri, Anna; Torroni, Antonio (5 October 2015). "Uncovering the sources of DNA found on the Turin Shroud". Scientific Reports. 5: 14484. doi:10.1038/srep14484. PMC 4593049. PMID 26434580. ^ Riani, M.; et al. (2013). "Regression analysis with partially labelled regressors: carbon dating of the shroud of Turin". Statistics and Computing. 23 (4): 551–561. doi:10.1007/s11222-012-9329-5. ^ a b c d e Poulle, Emmanuel (December 2009). "Les sources de l'histoire du linceul de Turin. Revue critique". Revue d'Histoire Ecclésiastique. 104 (3–4): 747–782. doi:10.1484/J.RHE.3.215. ^ a b Rogers, Raymond N. (20 January 2005). "Studies on the radiocarbon sample from the shroud of turin" (PDF). Thermochimica Acta. 425 (1–2): 189–194. doi:10.1016/j.tca.2004.09.029. Retrieved 31 July 2016. ^ a b Chivers, Tom (20 December 2011). "The Turin Shroud is fake. Get over it". Daily Telegraph. Retrieved 2 March 2018. ^ a b c R. A. Freer-Waters, A. J. T. Jull, "Investigating a Dated piece of the Shroud of Turin", Radiocarbon 52, 2010, pp. 1521–1527. ^ a b Schafersman, Steven D. (14 March 2005). "A Skeptical Response to Studies on the Radiocarbon Sample from the Shroud of Turin by Raymond N. Rogers". llanoestacado.org. Retrieved 2 January 2016. ^ a b c Gove, H. E. (1990). "Dating the Turin Shroud: An Assessment". Radiocarbon. 32 (1): 87–92. ^ a b c d e f Meacham, William (1983). "The Authentication of the Turin Shroud, An Issue in Archeological Epistemology". Current Anthropology. 24 (3): 283–311. doi:10.1086/202996. JSTOR 2742663. ^ According to LLoyd A. Currie, it is "widely accepted" that "the Shroud of Turin is the single most studied artifact in human history". Currie, Lloyd A. (2004). "The Remarkable Metrological History of Radiocarbon Dating" (PDF). Journal of the National Institute of Standards and Technology. 109: 200. ^ Habermas, G. R. (2011). "Shroud of Turin". In Kurian, G. T. (ed.). The Encyclopedia of Christian Civilization. Wiley-Blackwell. p. 2161. ^ "Is It a Fake? DNA Testing Deepens Mystery of Shroud of Turin". Live Science. Retrieved 9 April 2018. ^ Adler, Alan D. (2002). The orphaned manuscript: a gathering of publications on the Shroud of Turin. p. 103. ISBN 978-88-7402-003-4. ^ "How Tall is the Man on the Shroud?". ShroudOfTurnForJournalists.com. Retrieved 12 April 2009. ^ Heller, John H. (1983). Report on the Shroud of Turin. Houghton Mifflin. ISBN 978-0-395-33967-1. ^ Scott, John Beldon (2003). Architecture for the shroud: relic and ritual in Turin. University of Chicago Press. p. 302. ISBN 978-0-226-74316-5. ^ a b Miller, V. D.; Pellicori, S. F. (July 1981). "Ultraviolet fluorescence photography of the Shroud of Turin". Journal of Biological Photography. 49 (3): 71–85. PMID 7024245. ^ a b Pellicori, S. F. (1980). "Spectral properties of the Shroud of Turin". Applied Optics. 19 (12): 1913–1920. doi:10.1364/AO.19.001913. PMID 20221155. ^ Cruz, Joan Carroll (1984). Relics. Our Sunday Visitor. p. 49. ISBN 978-0-87973-701-6. ^ "Turin shroud 'older than thought'". BBC News. 31 January 2005. ^ "Shroud of Turin Saved From Fire in Cathedral". The New York Times. 12 April 1997. ^ a b Povoledo, Elisabetta (29 March 2013). "Turin Shroud Going on TV, With Video From Pope". New York Times. Retrieved 29 March 2013. ^ "Turin Shroud shown live on Italy TV". BBC News. 30 March 2013. Retrieved 30 March 2013. ^ "Turin Shroud goes back on display at city's cathedral". BBC News. 19 April 2015. Retrieved 19 April 2015. ^ Trautmann, Erik (7 October 2015). "Shroud of Turin replica on exhibit at St. Peter's Lutheran Church". The Hour. Retrieved 9 May 2018. ^ Dickerson, Hillary (8 April 2014). "Replica Shroud of Turin on display at St. Matthew". Galena Gazette. Retrieved 9 May 2018. ^ a b John Calvin, 1543, Treatise on Relics, trans. by Count Valerian Krasinski, 1854; 2nd ed. Edinburgh: John Stone, Hunter, and Company, 1870; reprinted with an introduction by Joe Nickell; Amherst, New York: Prometheus Books, 2009. ^ Kitzinger, Ernst (1954). "The Cult of Images in the Age before Iconoclasm". Dumbarton Oaks Papers. 8: 83. doi:10.2307/1291064. JSTOR 1291064. ^ Phillips, Thomas J. (16 February 1989). "Shroud irradiated with neutrons?". Nature. 337 (6208): 594. doi:10.1038/337594a0. ^ Address of John Paul II, 24 May 1998. ^ Pope John Paul II (24 May 1998). Address in Turin Cathedral (Speech). Turin, Italy. Archived from the original on 11 May 2000. ^ "Catholic News Service". Archived from the original on 11 June 2008. Retrieved 6 June 2016. ^ "Pastoral Visit to Turin: Veneration of the Holy Shroud in the Cathedral of Turin - Meditation of the Holy Father (May 2, 2010) - BENEDICT XVI". Retrieved 6 June 2016. ^ "2 May 2010: Pastoral Visit to Turin - Eucharistic Concelebration in St. Charles Square - BENEDICT XVI". Retrieved 6 June 2016. ^ "Newly beatified Holy Face nun remembered by Pope Benedict". Retrieved 6 June 2016. ^ "Pope Francis to pray before the Holy Shroud in Turin". Romereports.com. Retrieved 6 June 2016. ^ "Pope Francis to Venerate Famed Shroud of Turin in 2015". 6 November 2014. Retrieved 6 June 2016. ^ "Pope will visit Shroud of Turin, commemorate birth of St. John Bosco - National Catholic Reporter". Ncronlone.org. 5 November 2014. Retrieved 6 June 2016. ^ a b c Delage, Yves (1902). "Le Linceul de Turin". Revue Scientifique. 22: 683–87. ^ Tamburelli, Giovanni (November 1981). "Some Results in the Processing of the Holy Shroud of Turin". IEEE Transactions on Pattern Analysis and Machine Intelligence. PAMI-3 (6): 670–676. doi:10.1109/TPAMI.1981.4767168. ^ Damon, P. E.; Donahue, D. J.; Gore, B. H.; Hatheway, A. L.; Jull, A. J. T.; Linick, T. W.; Sercel, P. J.; Toolin, L. J.; Bronk, C. R.; Hall, E. T.; Hedges, R. E. M.; Housley, R.; Law, I. A.; Perry, C.; Bonani, G.; Trumbore, S.; Woelfli, W.; Ambers, J. C.; Bowman, S. G. E.; Leese, M. N.; Tite, M. S. (16 February 1989). "Radiocarbon dating of the Shroud of Turin". Nature. 337 (6208): 611–615. doi:10.1038/337611a0. Retrieved 31 July 2016. Herbermann, Charles, ed. (1913). "The Holy Shroud (of Turin)" . Catholic Encyclopedia. New York: Robert Appleton Company. ^ Dale, W.S.A. (1987). "The Shroud of Turin: Relic or Icon?". Nuclear Instruments and Methods in Physics Research. B29: 187–192. doi:10.1016/0168-583X(87)90233-3. This paper is significant in that it was presented to the international radiocarbon community shortly before radiocarbon dating was performed on the shroud. ^ S. Benford; J. Marino (July – August 2008). "Discrepancies in the radiocarbon dating area of the Turin shroud" (PDF). Chemistry Today. 26 (4): 4–12. Archived from the original (PDF) on 4 March 2012. Retrieved 10 September 2012. ^ Riani, Marco; Atkinson, Anthony C.; Fanti, Giulio; Crosilla, Fabio (27 April 2012). "Regression analysis with partially labelled regressors: carbon dating of the Shroud of Turin". Statistics and Computing. 23 (4): 551–561. doi:10.1007/s11222-012-9329-5. ^ Busson, P. "Sampling error?" Letter in Nature, Vol. 352, 18 July 1991, p. 187. ^ Fanti, Giulio; Baraldi, Pietro; Basso, Roberto; Tinti, Anna (July 2013). 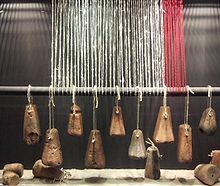 "Non-destructive dating of ancient flax textiles by means of vibrational spectroscopy". Vibrational Spectroscopy. 67: 61–70. doi:10.1016/j.vibspec.2013.04.001. Retrieved 31 July 2016. ^ Squires, Nick (28 March 2013). "Turin Shroud 'is not a medieval forgery'". Telegraph.co.uk. Retrieved 6 June 2016. ^ Stanglin, Doug (30 March 2013). "New test dates Shroud of Turin to era of Christ". USA Today. Associated Press. Retrieved 31 July 2016. ^ Tosatti, Marco (28 March 2013). "Sindone, la battaglia dei reperti. Ma Fanti li ha buoni…" [Shroud: the Battle of the Findings]. Vatican Insider (in Italian). Inchieste e interviste [Inquests and interviews]. Archived from the original on 11 October 2014. ^ Parker Jr., Shafer (6 May 2013). "Science Shines New Light on Shroud of Turin's Age". National Catholic Register. Padua, Italy: EWTN. Retrieved 31 July 2016. ^ McCrone, W. C., Skirius, C., The Microscope, 28, 1980, pp 1–13; McCrone, W. C., The Microscope, 29, 1981, pp. 19–38. The Microscope 1980, 28, 105, 115; 1981, 29, 19; Wiener Berichte uber Naturwissenschaft in der Kunst 1987/1988, 4/5, 50 and Acc. Chem. Res. 1990, 23, 77–83. ^ a b c d Rogers, Raymond N. (July 2008). A Chemist's Perspective On The Shroud of Turin. Lulu Press, Inc. ISBN 9780615239286. ^ "DNA of Jesus-era shrouded man in Jerusalem reveals earliest case of leprosy". Physorg.com. 16 December 2009. Retrieved 16 December 2009. ^ Bell, Bethany (16 December 2009). "'Jesus-era' burial shroud found". BBC News. Retrieved 16 December 2009. ^ "Shroud of Turin Not Jesus', Tomb Discovery Suggests". National Geographic Daily News. 19 December 2009. Retrieved 22 March 2010. ^ "Secrets of the Dead: Shroud of Christ?". PBS.org. Retrieved 28 July 2010. ^ Heller, John H.; Adler, Alan D. (15 August 1980). "Blood on the Shroud of Turin". Applied Optics. 19 (16): 2742–4. doi:10.1364/AO.19.002742. PMID 20234501. ^ McCrone Research, Initial Examination – 1979, retrieved 16 June 2013. ^ P. L. Baima Bollone, "Indagini identificative su fili della Sindone", Giornale della Accademia di Medicina di Torino, no. 1–12, 1982, pp. 228–239. ^ "shroud of Turin". Skepdic.com. 23 August 2000. Retrieved 12 April 2009. ^ Baden, Michael. 1980. Quoted in Reginald W. Rhein, Jr., "The Shroud of Turin: Medical examiners disagree". Medical World News, 22 December, p. 50. ^ Danin, Avinoam (1998). "Where Did the Shroud of Turin Originate? A Botanical Quest". ERETZ Magazine (November/December). ^ Sheler, Jeffery L. (24 July 2000). "Shroud of Turin - Mysteries of History". U.S. News & World Report. Archived from the original on 3 December 2010. Retrieved 19 December 2010. ^ Ian Wilson. The Shroud, p. 100. ^ Avinoam Danin (2008). Botany of the Shroud of Turin, An addition concerning new information since the 1999 report. Shroud of Turin Conference, 2008, Ohio. ^ a b c Salvatore Lorusso, Chiara Matteucci, Andrea Natali, Tania Chinni, Laura Solla (2011). "The Shroud of Turin between history and science: an ongoing debate". Conservation Science in Cultural Heritage. Vol 11, University of Bologna. ^ Boi, M. (1 April 2017). "Pollen on the Shroud of Turin: The Probable Trace Left by Anointing and Embalming". Archaeometry. 59 (2): 316–330. doi:10.1111/arcm.12269. ISSN 1475-4754. ^ Ball, Philip (May 2017). "Material witness: Is this holy relic preserved?". Nature Materials. 16 (5): 503. doi:10.1038/nmat4897. ISSN 1476-4660. PMID 28439114. ^ Pierluigi Baima Bollone, "Interpreting the Image on the Shroud", in Gian Maria Zaccone, Le due facce della Sindone. Pellegrini e scienziati alla ricerca di un volto, Torino, ODPF, 2001, pp. 119–126. ^ a b Fanti, G.; Basso, R.; Bianchini, G. (2010). "Turin Shroud: Compatibility Between a Digitized Body Image and a Computerized Anthropomorphous Manikin". Journal of Imaging Science and Technology. 54 (5): 050503. doi:10.2352/J.ImagingSci.Technol.2010.54.5.050503. ^ Paul, Gregory S. (6 May 2010). "The Shroud of Turin: The Great Gothic Art Fraud". Secular Web Kiosk. Internet Infidels. Retrieved 9 May 2010. ^ Bevilacqua, M.; et al. (2013). "Do we really need new medical information about the Turin shroud?". Injury. 45 (2): 460–464. doi:10.1016/j.injury.2013.09.013. PMID 24135252. ^ Nickell, Joe (2018). "Crucifixion Evidence Debunks Turin 'Shroud'". Skeptical Inquirer. 42 (5): 7. ^ J. Dee German. "On the Visibility of the Shroud Image" (PDF). Retrieved 6 June 2016. ^ Jackson, John P., Eric J. Jumper, Bill Mottern, and Kenneth E. Stevenson. 1977. "The three-dimensional image of Jesus' burial cloth", Proceedings, 1977 United States Conference of Research on The Shroud of Turin, Holy Shroud Guild, New York, 1977, pp. 74–94. ^ Lombatti, Antonio (1997). "Doubts Concerning the Coins Over the Eyes". British Society for the Turin Shroud Newsletter (45). ^ Fanti, Giulio; Maggiolo, Roberto (1 June 2004). "The double superficiality of the frontal image of the Turin Shroud". Journal of Optics A: Pure and Applied Optics. 6 (6): 491–503. doi:10.1088/1464-4258/6/6/001. ^ Raymond E. Brown (15 August 2002). Biblical Exegesis and Church Doctrine. Wipf & Stock Publishers. pp. 150–152. ISBN 978-1-59244-024-5. ^ Owen, Richard (26 April 2009). "Knights Templar hid the Shroud of Turin, says Vatican". The Times. Retrieved 24 October 2010. her study of the trial of the Knights Templar had brought to light a document in which Arnaut Sabbatier ... was shown 'a long linen cloth on which was impressed the figure of a man' and instructed to venerate the image by kissing its feet three times. ^ a b c Owen, Richard (21 November 2009). "Death certificate is imprinted on the Shroud of Turin, says Vatican scholar". The Times. Retrieved 24 October 2010. .
^ "New Light on the Shroud". Archived from the original on 30 September 2011. Retrieved 6 June 2016. ^ Vallerani, Massimo, "I templari e la Sindone: l'"ipotetica della falsità" e l'invenzione della storia", Historia Magistra, 2, 2009, abstract. Retrieved 24 October 2010. ^ Squires, Nick (3 May 2010). "Pope Benedict says Shroud of Turin authentic burial robe of Jesus". Christian Science Monitor. Retrieved 6 June 2016 – via Christian Science Monitor. ^ Garlaschelli, L. (2010). "Life-size Reproduction of the Shroud of Turin and its Image". Journal of Imaging Science and Technology. 54 (4): 040301. doi:10.2352/J.ImagingSci.Technol.2010.54.4.040301. ^ Fanti, G.; Heimburger, T. (2011). "Letter to the Editor Comments on 'Life-Size Reproduction of the Shroud of Turin and Its Image' by L. Garlaschelli". Journal of Imaging Science and Technology. 55 (2): 020102. doi:10.2352/j.imagingsci.technol.2011.55.2.020102. ^ "Remaking the Shroud". Channel.nationalgeographic.com. 22 January 2015. Retrieved 6 June 2016. ^ Allen, Nicholas P. L. (1993) The methods and techniques employed in the manufacture of the Shroud of Turin. ^ Hamilton, J.F. (1974). "Physical Properties of Silver Halide Microcrystals". Photographic Science and Engineering. 18 (5): 493–500. ^ a b Fanti, G.; Moroni, M. (1 March 2002). "Comparison of Luminance Between Face of Turin Shroud Man and Experimental Results". Journal of Imaging Science and Technology. 46 (2): 142–154. Retrieved 1 August 2016. ^ Ingham, Richard (21 June 2005). "Turin Shroud Confirmed as Fake". Physorg.com. Agence France-Presse. Retrieved 17 February 2008. ^ Thibault Heimburger. "The Turin Shroud Body Image: The Scorch Hypothesis Revisited" (PDF). Retrieved 6 June 2016. ^ "Features of the Center". Shroud Center of Southern California. Retrieved 27 March 2010. ^ a b Fanti, G.; Botella, J. A.; Di Lazzaro, P.; Heimburger, T.; Schneider, R.; Svensson, N. (2010). "Microscopic and Macroscopic Characteristics of the Shroud of Turin Image Superficiality". Journal of Imaging Science and Technology. 54 (4): 040201. doi:10.2352/J.ImagingSci.Technol.2010.54.4.040201. ^ Alan A. Mills, "Image formation on the Shroud of Turin", in Interdisciplinary Science Reviews, 1995, vol. 20 No. 4, pp. 319–326. ^ Jackson, John P.; Jumper, Eric J.; Ercoline, William R. (15 July 1984). "Correlation of image intensity on the Turin Shroud with the 3-D structure of a human body shape". Applied Optics. 23 (14): 2244. doi:10.1364/AO.23.002244. PMID 18212985. ^ Baldacchini, G.; Lazzaro, P. Di; Murra, D.; Fanti, G. (2008). "Coloring linens with excimer lasers to simulate the body image of the Turin Shroud". Applied Optics. 47 (9): 1278–1285. doi:10.1364/ao.47.001278. ^ Di Lazzaro, P.; Baldacchini, G.; Fanti, G.; Murra, D.; Santoni, A. (22 April 2009). "Colouring fabrics with excimer lasers to simulate encoded images: the case of the Shroud of Turin" (PDF). XVII International Symposium on Gas Flow, Chemical Lasers, and High-Power Lasers. XVII International Symposium on Gas Flow, Chemical Lasers, and High-Power Lasers. 7131. pp. 71311R–71311R–6. doi:10.1117/12.816826. ^ Fanti, G. (2011). "Hypotheses Regarding the Formation of the Body Image: A Critical Compendium [Abstract]". The Journal of Imaging Science and Technology. 55 (6): 060507. doi:10.2352/J.ImagingSci.Technol.2011.55.6.060507. ^ Fanti, G. (2010). "Can a Corona Discharge Explain the Body Image of the Turin Shroud?". J. Imaging Sci. Technol. 54 (2): 020508. doi:10.2352/j.imagingsci.technol.2010.54.2.020508. ^ Squires, Nick (28 March 2013). "Turin Shroud 'is not a medieval forgery'". The Daily Telegraph. Retrieved 28 March 2013. ^ Di Lazzaro, Paolo; Murra, Daniele; Santoni, Antonino; Nichelatti, Enrico. "The Conservation of the Shroud of Turin: Optical Studies". Archived from the original on 16 April 2013. Retrieved 10 April 2013. ^ "COLORAZIONE SIMIL–SINDONICA DI TESSUTI DI LINO TRAMITE RADIAZIONE NEL LONTANO ULTRAVIOLETTO" (PDF). ISSN 0393-3016. ^ a b Boyle, Alan (23 December 2011). "Was Holy Shroud created in a flash? Italian researchers resurrect claim". Cosmic Log. NBC News. Retrieved 29 June 2014. ^ a b Curciarello, F.; De Leo, V.; Fazio, G.; Mandaglio, G. (March 2012). "The abrupt changes in the yellowed fibril density in the Linen of Turin". Radiation Effects and Defects in Solids. 167 (3): 224–228. doi:10.1080/10420150.2011.629320. Picknett, Lynn and Prince, Clive: The Turin Shroud: In Whose Image?, Harper-Collins, 1994 ISBN 0-552-14782-6. Nickell, Joe : Inquest on the Shroud of Turin: Latest Scientific Findings, Prometheus Books; Subsequent edition, 1998, ISBN 1-57392-272-2. Di Lazzaro, Paolo (ed.) : Proceedings of the International Workshop on the Scientific Approach to the Acheiropoietos Images, ENEA, 2010, ISBN 978-88-8286-232-9. 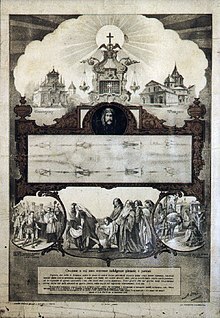 Wikimedia Commons has media related to Shroud of Turin. Professor Creates 3D Image From Shroud - Giulio Fanti, a professor at the University of Padua, has created a 3D image of Christ based on the Shroud of Turin.